"What do you want from me?!" 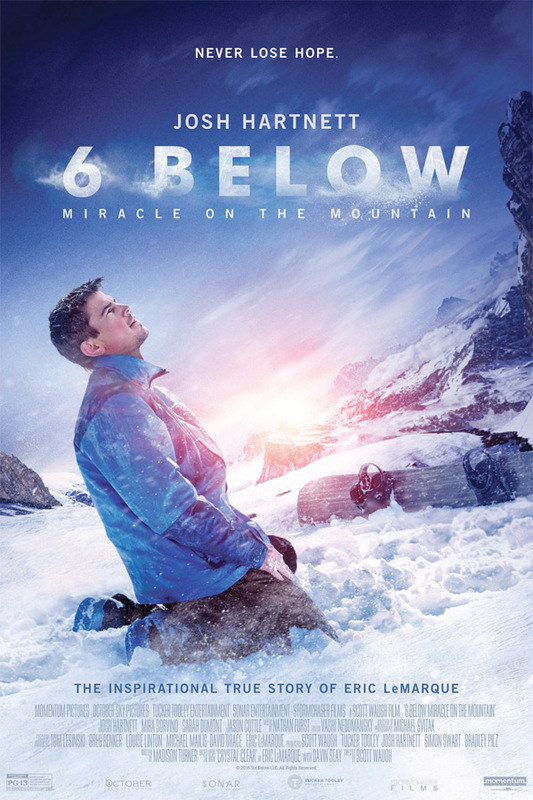 Momentum Pictures has debuted the first official trailer for a survival movie called 6 Below: Miracle on the Mountain, telling the faith-based story of a former hockey player and adrenaline junkie who gets stranded in the mountains. He must "battle his own personal demons" in order to survive. Josh Hartnett stars as as Eric LeMarque, who ends up lost while snowboarding in the High Sierras when a massive winter storm hits. Also starring Mira Sorvino, Sarah Dumont, Kale Culley, and Jason Cottle. Despite this being billed as "one of the most amazing tales of survival" it looks pretty much like every other tale of snowy survival. Right down to the wolves. And that song makes my eyes roll big time. When a snowstorm strands former professional hockey player Eric LeMarque (Josh Hartnett) atop the Sierra Nevada Mountains for eight days, he is forced to face his past and come to terms with his personal demons and rediscover the power of faith within him in order to survive. 6 Below: Miracle on the Mountain is directed by American filmmaker and former stunt man Scott Waugh, director of the films Act of Valor and Need for Speed previously. The screenplay is also written by former stuntman Madison Turner. This has not premiered at any film festivals or otherwise. Momentum Pictures will release 6 Below: Miracle on the Mountain Trailer in theaters everywhere starting October 13th this fall. Anyone interested in this?